So glad to know you are an Austin garden blogger. I think your boulders and grasses are great — look forward to following your posts. Funny story, Cyndi. I’m so glad the spines didn’t get you in the back of the head. Hey, I’m going to remember that glue trick. I’ve gotten a pawful of glochids (the almost invisible spines) a few times myself. Thanks for visiting my blog. Since you commented anonymously, my responses won’t get to you – think you need to sign on to google/blogger just with your name so you can comment. Anyway – that’s so funny that you recognized my rock path. I thought you were going to say you recognized it from the Statesman, because it’s been in there — I think it was a few months ago. I write a monthly column for them that usually appears on the 3rd Saturday of the month. Diana – Thanks for the welcome, and I will look for you in the Statesman! Please, chime in if you stop by again and have an opinion about what I’m up to in the garden. I need to go to your blog and ask you this….but maybe you’ll see it here- Did the lamb’s ear make it in your new front bed this summer….that bed gets FULL sun, right? That is a funny story about Ms. Rita–glad you weren’t injured. I liked the post about the Gulf Muhly–I love that plant and for some reason, mine just never looks like all the others that I see. It grows, but never seems to develop the beautiful seed head plumes. Sigh. I enjoy them in other’ gardens though . Saw your answer to me about the roses on your blog; I inherited some roses with this house….need to move them…not sure if it’s worth it…but a friend gave me a book to learn more about growing them. I’m just noticing blogger’s roses a lot…they’re on my mind. I kinda whacked at mine a couple of weeks ago and gave them some fertilizer – organic all-purpose. I dunno…. Cyndi, I put a Santa Rita it in the “hell strip” I share with the neighbor and she was thrilled. So we all “wuv” it! Yeah, think I’ll be sharing mine also; I’m putting her in a very dry strip between me and a neighbor (she’ll be along side a gorgeously shaped old sago that thrives there. As the Santa-Rita grows (knock, knock), she’ll eventually screen the huge municipal transformer box that sits on the property line. Funny how I haven’t posted photos of that lovely view yet! Hi, Cat….just cheked out your blog….what a delightful escape! 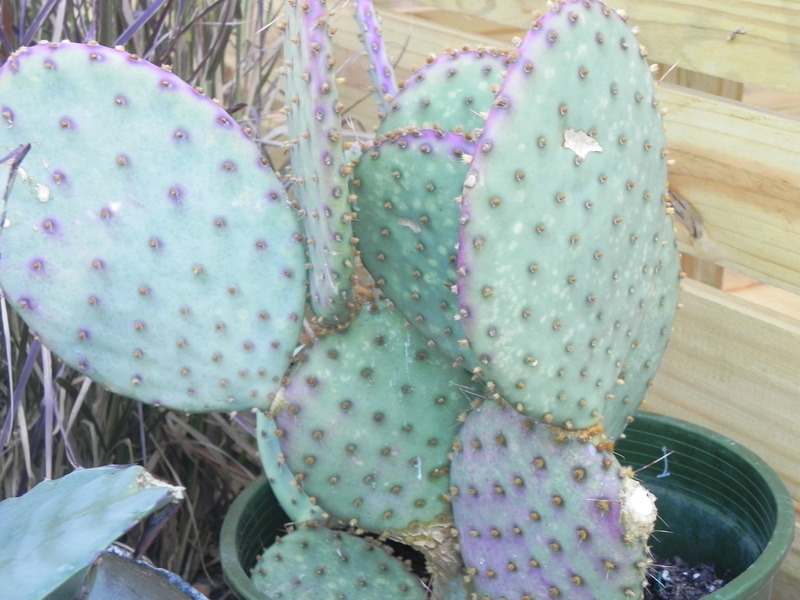 Yes, i think the soft hues of Ms. Rita are dreamy – she’s part cactus part sea coral I think. Just had to tell you, I got into a bunch of tiny cactus thorns this evening while working in the garden and I used the glue method. It works! Can you believe you’d help someone The Very Next Day! Really, thank you. I have never, ever done this before and it’s painful. So thanks so very much because they are impossible to get out any other way.